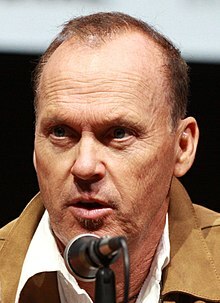 Michael John Douglas (born September 5, 1951), better kent bi his stage name Michael Keaton, is an American actor, producer, director, an comedian. He first rose tae fame for his roles on the CBS sitcoms All's Fair an The Mary Tyler Moore Hour an his comedic film roles in Night Shift (1982), Mr. Mom (1983), Johnny Dangerously (1984), an Beetlejuice (1988). He earned faur acclaim for his dramatic portrayal o the teetle chairacter in Tim Burton's Batman (1989) an Batman Returns (1992). Syne then, he has appeared in a variety o films rangin frae dramas an romantic comedies tae thriller an action films, sic as Clean and Sober (1988), The Dream Team (1989), Pacific Heights (1990), Much Ado About Nothing (1993), My Life (1993), The Paper (1994), Multiplicity (1996), Jackie Brown (1997), Herbie: Fully Loaded (2005), The Other Guys (2010), Robocop (2014), Need for Speed (2014), Spotlight (2015), The Founder (2016), an haes an aw providit vyces for chairacters in animatit films sic as Cars (2006), Toy Story 3 (2010), an Minions (2015). He appears as the supervillain Vulture in the Marvel Cinematic Universe films Spider-Man: Homecoming an Spider-Man: Far From Home. Keaton's lead performance in Birdman or (The Unexpected Virtue of Ignorance) (2014) earned him a Gowden Globe Awaird for Best Actor in a Muisical or Comedy, the Creetics' Choice Awaird for Best Actor an Best Actor in a Comedy, an nominations for the Screen Actors Guild Awaird, Breetish Academy Film Awaird, an Academy Awaird for Best Actor. He previously received a Gowden Globe Awaird nomination for his performance in Live from Baghdad (2002) an a Screen Actors Guild Awaird nomination for The Company (2007). Keaton wis awairdit a Career Achievement Awaird frae the Hollywood Film Festival. On 18 Januar 2016, he wis named Officer o Order o Airts an Letters in Fraunce. He is an aw a veesitin scholart at Carnegie Mellon Varsity. ↑ Waxman, Sharon (November 16, 2014). "Hollywood Film Awards: Slowly Killing the Golden Goose". TheWrap.com. Retrieved December 4, 2014. ↑ "Michael Keaton Gets France's Order of Arts and Letters Honor". Variety. January 18, 2016. Retrieved January 20, 2016. ↑ Kelly, Saavedra (January 12, 2015). "Actor Michael Keaton Discusses His New Role at the ETC". The Piper. Retrieved February 23, 2015. This page wis last eeditit on 17 Februar 2019, at 04:18.